These are need-no-special-occasion cupcakes. Actually, they aren’t really cupcakes at all, but muffins. 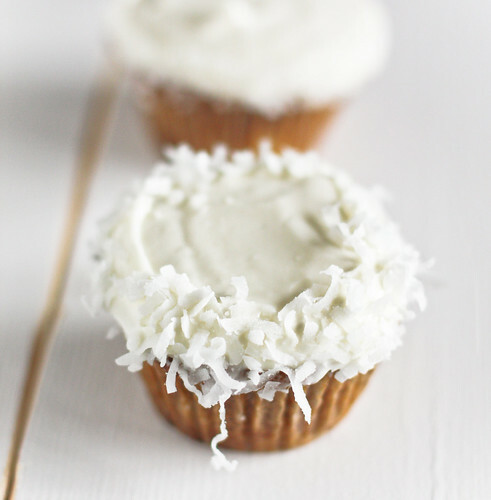 Throw on some pretty white icing though, some sprinkles and some coconut, like a fancy new dress and a set of pearls, and it’s transformed into a cupcake. The muffin-like base, chock full of carrot and pineapple is accented perfectly by the sweet-tangy cream cheese frosting. Great for a Tuesday afternoon. Especially if it’s a Tuesday afternoon like this one, all dark and gloomy. These are a sure fire way to brighten your day. Preheat the oven to 350°F. Line cupcake pan with liners. In a bowl, whisk together the flour, granulated sugar, baking soda, baking powder, spices, and salt. In a small bowl, whisk together the oil and eggs until blended, and then stir the egg mixture into the flour with a rubber spatula. Fold in the walnuts, pineapple, and grated carrot. 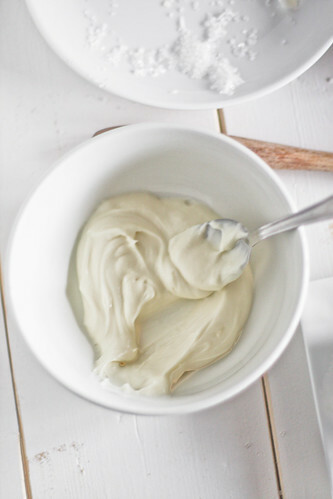 In a mixing bowl, combine cream cheese, confectioners' sugar, and 1/2 teaspoon vanilla extract. Whisk until smooth. NOTE: This won’t make enough to generously frost each cupcake. You might want to double it. P.S. The lovely Sean from Take Thou Food posted an interview with me today! You can see that here. Thanks, Sean! Really, really beautiful photos, Hannah. I love all the white. Oh *drool*. Over both your pictures and the cupcakes... er, muffins. Your interview was great! And you know I whole-heartedly agree with Sean about how amazingly talented you are. Plus, you are such an inspiration - both from your work on your blog and pictures and also your really positive attitude. Here's hoping a bit of both rub off. Mmmmm.I just made carrot walnut bread last night (which, divided into muffins and topped with c.c. frosting, would become cupcakes too!). It is amazing how delicious grated carrots can be when blended with spices and sugar! Your photos are soooo beautiful!! I love carrot cake, cupcakes just seem perfect! Beautiful photos and delicious recipes - your winning combo! I love it. Those are beautiful cupcakes. I love cream cheese icing! Classic flavours combo here. 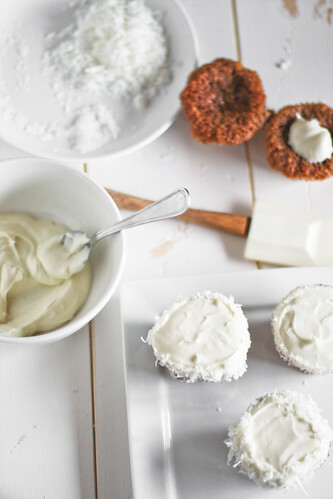 I love good carrot cupcakes with cream-cheese icing! totally drooling here!!!! my friend's bachelorette party is coming up and she just LOVES carrot cake so this would be the perfect gift to make for her on the sunday brunch we are having! thanks for sharing! oh, delicious. and somehow with "carrot" in the name, at least half the guilt of eating them flies out the window...meaning i would probably eat twice as many. beautiful, hannah. and beautiful images, as always. Incredibly beautiful! I can taste them already. 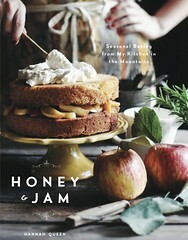 I cannot wait to try these, Hannah as I love carrot cake so these will be fun to make. 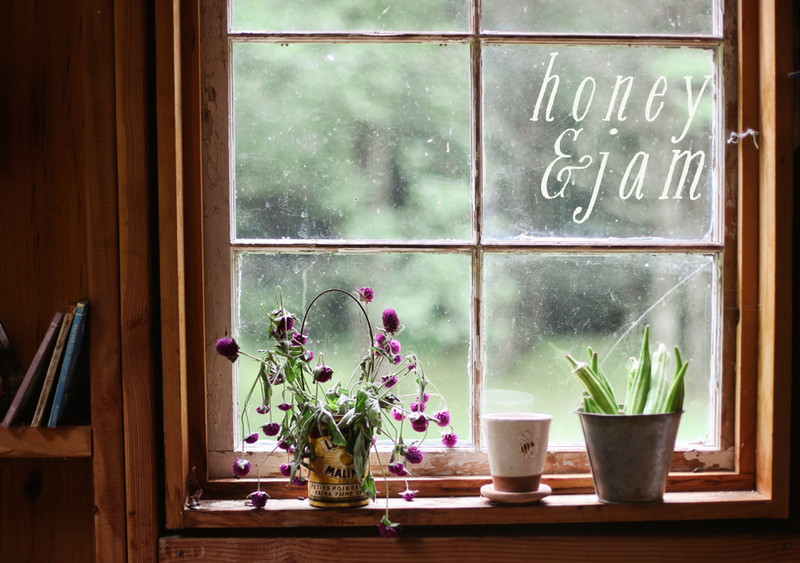 I love your blog header and overall design - it is so inviting, and your pictures are AmaZiNg! Fancy new dress and a set of pearls...I love that! Yes you've dressed these muffins up perfectly! Carrot cake is healthy, right :>) The photos are exquisite. I suspect the cupcakes are pretty good too. Classic! Perfect for when you just want a little something something and not feel bad about eating it. Great photos! These are so cute!! Awesome photos! Your recipes are amazing - I made the apple and cheddar scones tonight! But that mug in your banner is beautiful! Please tell me where you got it - it will haunt me until I find one! What lovely cupcakes-muffins! They look delicious! i'm such a sucker for carrot cake (or, for that matter, anything smothered in cream cheese frosting...) and these are lovely. the kicker for me is that coconut garnish--perfection! thanks for visiting my blog! glad i could come to yours. wonderful images... and yummy cupcakes! p.s. : i'm posting flickr favourites on my blog every so often and was wondering if i could include one of your lemon tart shots. perhaps you'd like to stop by to check out my place and let me know if that's ok? Hannah- These are simply gorgeous! Love the white! Looks yummy! Thanks for this recipe. Perfect for a treat. Hi, thank you so much for visiting my blog. Your images are amazing. I have never made cupcakes and now I am tempted. I especially love that first photo :) Have a great weekend and now I will pop in on you regularly. These cupcakes are gorgeous, Hannah!! Very pretty as always, Hannah. 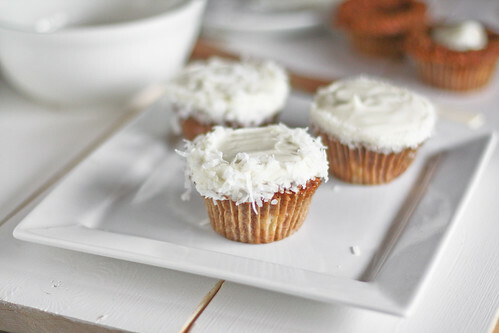 I love coconut with carrot cake-so good. one must bake when gloomy weather appears. These look great, love the coconut border! YUM. I love the addition of coconut. These are perfect. I love the coconut! those look gorgeous! i bet they tasted just as good! I love that this recipe only makes 9 the perfect amount for us. i love the addition of pineapple to the carrot cake! i bet it's a lovely combination! ooohhhhh this is so great! we are having a welcome to the world party for our son in a few weeks and we want to have carrot muffins and so I just was searching your archives and booom! Carrot cupcakes with cream cheese frosting! you just made my day! thanks! The carrot flavor shines in these unforgettably moist carrot cake cupcakes.